“Yes, it is true that last year I wanted to improve. Although it wasn’t my best year, it was not too bad. My performance level was not so good. Maybe I did not have the same freedom and opportunities as I had last year." Starting in January in Argentina and finishing in October in China, Beñat Intxausti has had a long season. The Movistar climber acknowledges that it has not been his best year and that he has been unable to follow the progression he showed last year when he won a stage and wore the leader’s jersey at the Giro d’Italia and won the Tour of Beijing. In 2015, he wants to return to his best level as he enters his 8th season in the professional ranks. In 2014, Benat Intxausti lined up at the Tour de France and reached the finish in Paris after a race where he had been hampered by illness. He had his best races in the Tour de Romandie where he finished sixth behind Chris Froome, Simon Spilak, Rui Costa, Mathias Frank and Vincenzo Nibali, and the Tour de Pologne where he was third behind Rafal Majka and Ion Izagirre. Now enjoying his off-season, he has been riding his mountain bike in the Basque Country and is hoping to return to his best level in 2015 after a disappointing 2014 season. Intxausti looks back at his performances in Romandie and Poland with fond memories. 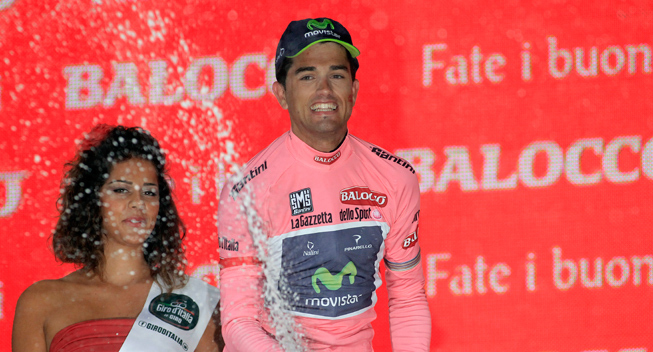 In 2013, Intxausti led Movistar in the Giro d’Italia. He paid back the confidence by winning a stage, leading the race for a day and finishing in the top 10. Next year he hopes to return to the Italian grand tour. “I would like to follow the line from last year, achieving significant victories like in China and the Giro,” he says. “That highlights your season and is a prize for the hard work. I would like to return to the Giro d'Italia, maybe make a similar year to 2013. The truth is that we have not spoken with the team about the calendar yet. Much will depend on which grand tours Nairo and Alejandro want to do. Fortunately, we have very good leaders but we also have our opportunities and we must try to take advantage of them. Intxausti is especially looking back at his stint in the maglia rosa with fondness. Intxautsi made his breakthrough when he finished on the podium in the 2010 Vuelta al Pais Vasco. The home race still plays a special role for the Basque. This year Intxausti was set to play a key role for Alejandro Valverde in the Tour de France but the race never turned out as he had hoped.